Morocco’s Amal Center: Women Train for Economic Empowerment. Amina is Mohamed’s older sister. She is six, kneeling under a blanket next to her mother, who holds three-year-old Mohamed in her lap. All three have the same wide, dark eyes as Hassan and Hussam, the two small boys tumbling on the blanket next to them. Amina watches a man drop three coins into her mother’s hand. The boys continue to play and Mohamed continues to cry. Hasaniya, their mother, quietly thanks the man and Amina smiles. The family occupies a three-meter square against a stone wall on a small street in Fez, one of Morocco’s largest cities. Hasaniya is a widow and, like many Moroccan women in her position, has found it both culturally and logistically impossible to work. Hourly employment in a tourist shop in the medina requires a basic command of English; she never attended high school. Her youngest child is not of school age, which rules out full time labor. If she did find a job with suitable hours that allowed her to care for her children, she would still have to fight the stigma against hiring a widowed woman. Three hours south-west of Fez, Rashida, also a widow with two children, is beginning her first day of work. 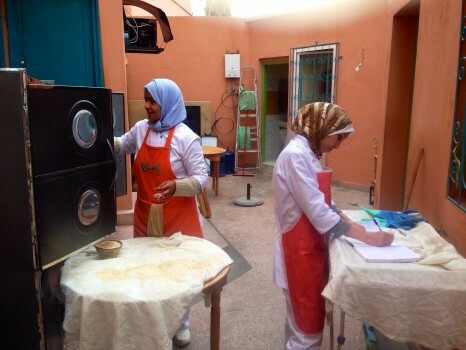 The orphanage organization in Marrakesh referred her to the Amal Women’s Training Center and Moroccan Restaurant, where she is now dressed to begin her waitress training. She and nine other Moroccan women are Amal’s first official class of trainees. These benefeciers, as the staff call them, will spend four months learning to cook or serve in a professional restaurant setting, “graduate” with a certificate of completion and, insha’Allah, land a full time job in Marrakesh. Amal is Morocco’s first full-time job training program exclusively for women. Despite the ratification of numerous international conventions on gender equality, and the enactment of laws “affirming the parity in the labor market between men and women,” the economic integration of women has declined over the past ten years. The center seeks to counteract the severe barriers to employment Moroccan women face, particularly when widowed with children. The Amal foundation began unofficially in 2008, when Noora Fitzgerald began organizing lunches for her friends, offering one-off paid opportunities for Moroccan women, whom she would hire to cook and staff the events. Recognizing that this wasn’t a sustainable endeavor, (her friends could eat only so much), she officially incorporated Amal as a foundation and restaurant in November 2012. In July of 2013, the center received a Swiss grant for three years of funding, with plans to be a self-sustaining restaurant and training program by 2016. While in training, the women receive two meals a day, a weekly transportation stipend, and a bonus upon completion. Trainees have access to Arabic literacy courses, on-site English and French teachers, and classes in basic accounting and hospitality. The restaurant has a brightly decorated “Kid’s Room,” (renovated and staffed by an American preschool teacher), available to customers and staff with children. Located on the first floor of a renovated Moroccan home and extending into the garden, the property has an outdoor shed that now serves as a brightly lit kitchen. Women, including one full time professional chef, move about in bright orange aprons. Some knead bread, some wash dishes, and three trainees take notes on clipboards. The women cook a traditional Moroccan menu, with a few very American, very chocolate, dessert additions. Amal’s new managing director, Hasan Moulay, adamantly asserts that Amal’s number one priority is to find employment for the organization’s beneficires upon graduation. Since training began on February 10, seven Amal customers – local restaurant and hotel managers themselves – have asked to hire a future Amal graduate. The center differs from a traditional restaurant not only in its gendered focus, but also in the full time staff hired at its inception. In addition to a manager, chef, and marketing director, Amal enlisted a professional social worker with a PhD in clinical psychology. Fatima Al-Zahra, a petite woman in a full-length grey overcoat and hijab, explains that she serves as the liaison between local charities and the restaurant. Fatima Al-Zahra weilds HR power and selects the ten young women who will train with Amal. Fatima gently but firmly explains that while there are many “people in need” in Marrakesh, Amal is not a charity. She holds tight to a certain “profile” when selecting the women: demonstrated financial hardship, and clear motivation to work for financial independence. While Fatima utilizes her background in social work to serve as an on-site counselor for the young women, she is unapologetic in explaining that she also employs her psychology education to screen for “good character and behavior” in trainee applicants. Like Amal’s manager, Hasan, Fatima affirms that permanent employment and financial independence for Amal’s women is the top priority. Amal’s managers, chefs, and trainees expressed hope that, should the organization succeed in Marrakesh, similar centers could be established throughout Morocco. The center’s childcare services, language classes, transportation stipends, and social work staff are a model of culturally-relevant, multifaceted support. Future locations could enable access to economic empowerment and financial independence for women like Husaniya, currently living with her four children on a street in Fez. *Erin Kilbride is co-editor for Muftah’s Yemen and Gulf pages. → 50 Young Israelis to Netanyahu: “We Refuse to Serve in the Occupation Army”. ← The Blue City of Morocco.